Online job opportunities are increasingly available, as well as online marketplaces for those with crafty skills to sell unique wares. But what if you're not looking for something that requires a serious time commitment? If you want to make a few bucks for spending a few minutes of downtime while waiting through commercials or during a boring conference call, here's a great list for you. Even better, some places will give you cash back for shopping at places you already shop at anyway. You'd just be leaving money on the table if you don't sign up! InboxDollars is another program that lets you make money doing a variety of things online. Complete free offers and earn up to $20 by trying out or signing up for various products and services. For example, earn credits for searching with Bing! or sign up for different rewards programs. Earn $5 just for signing up! Take surveys. Even if you are disqualified from a survey, you get a spin on Billy's Spin and Win which lets you earn survey tokens and sweepstakes entries. Play your favorite games at no cost or get 10% back when you purchase token packs and boosters. Use the InboxDollars search engine and earn cash. Watch videos or complete required activities. Shop online through their partners and earn cash back on everyday purchases. Sign up for InboxDollars today and get $5! There are many ways to earn with Swagbucks. Shop popular retailers through their portal and earn points called SB. For example, you can get 4 SB per dollar at Amazon or 8 SB at Travelocity. Even better, they often have special discounts, like 15% off any order at JCPenny plus get 4 SB per Dollar. Earn $5 just for signing up! Take surveys to earn SB. You can earn 60 SB every day just by completing the daily surveys. Highly targeted Gold Surveys allow you to earn even more SB. Search using the Swagbucks search engine. Just use their search engine to do your usual internet searches and earn SB! Watch videos and earn up to 150 SB per day. Choose from a variety of videos including fashion, entertainment, cooking, news, and more. Play games and earn SB for any money you spend on your favorite games anyway. Swagbucks VISA Rewards Credit Card: Get 1,000 SB just for making a purchase within the first 3 billing cycles. Earn an additional 2,500 SB if you spend $1,000 within the first 6 billing cycles. Earn 1.25 SB per Dollar on every purchase. Sign up for Swagbucks today to get a $5 signup bonus. Earn points for searching the internet through Bing Rewards. That's it. Easy. You can earn $100-$200 a year in rewards just by using Bing's search egine to do searches you do every day anyway. Use Bing on your desktop, tablet, or mobile devices (you even earn credits just by downloading the app). Credits can be redeemed for airline miles, meal discounts, or gift cards from popular retailers like Starbucks and Amazon. Sign up for Bing Rewards today! If you like shopping and have kids who are college bound, Sallie Mae's Upromise service is a great way to save for your child's academic future. Upromise creates a college savings service that harnesses the purchasing power of parents, extended family, family, and students to earn rewards. These rewards go into an account that helps combat student loan debt. A brilliant idea, especially knowing how expensive college can be. Earn 5%-10% cash back with over 850 online shopping partners, including Sears, Groupon, Staples, and Macy's. Earn 2-8% cash back at over 10,000 participating restaurants. Earn 5% cash back when booking travel with their travel partners. Earn cash back by redeeming Upromise ecoupons. Earn cash back by signing up for offers from local businesses and services. Get a boost in cash back rewards by signing up for the Upromise MasterCard (extra 5% on online shopping, restaurants, and online travel, 2% on department stores and movie theaters, and 1% on all other purchases). Sign up for Upromise today! These sites offer cash back for shopping at their partners. Ebates: Features a "Daily Double" store that offers double cash back. For example, you can get 16% cash back for a Daily Double store, plus any available discounts or coupons they have available. Earn cash back even easier with the Ebates Cash Back Button, which will alert you if you're browsing a participating site. Sign up for Ebates today! TopCashBack: Passes 100% of the commission it makes to members, earning them the title of "most generous cash back site." Sign up for TopCashBack today! FatWallet: Current deals include up to 4% back for shopping at ebay, 6% at Groupon, or up to 27.5% at Angie's List! Sign up for FatWallet today! Rebate Codes: Rebate Codes offers cash back at over 900 stores (for example, 3% at Amazon and 3.5% at Overstock) as well as over 50,000 coupons. Sign up today and get $5 for joining! Dollar Dig: A newcomer in the cashback world, Dollar Dig offers cash rebates at over 2,600 stores. You can earn up to 60% cashback, as well as straight dollar amounts for signing up for offers. Sign up for Dollar Dig today! Ibotta: Earn cash back for everyday purchases like groceries, household items, and more. Sign up for Ibotta today! If you aren't getting rewards for your credit card spending, it's time to join and start cashing in. There are some really great cash back credit cards available right now. Do you earn extra income online? How? Although I just started, I am beyond excited to basically get paid for my opinion. With our economy its important to have other money-paying options beyond just working. It seems counter productive for a personal finance website to advocate shopping to "make money"
What an enlightening post! I haven't heard about a lot of these sites and making easy money is a definite plus. I have been making money in internet marketing for several years now. It is a great opportunity since all you really need is a computer and an internet connection. One strategy on eBay is to purchase items that are in the auction format on the site (at a great price) and then list the same item as a "buy it now" accepting offers. If you take excellent pictures and do your research, you can flip items at a profit. The key is to know what you are buying, values and show patience. I experienced a lot of success selling collectibles using this approach. You can also search the "deal a day" sites for great bargains and turn around and flip the item. A crucial step is to research what items have been selling historically on eBay in the completed listings section. Great blog post! 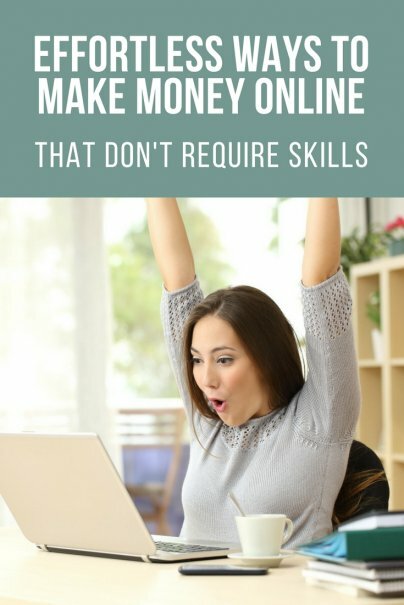 I would agree with everything said but the points suggesting that selling your time for money (like get part time job or sell service on Fiverr.com) is a way. In my view the money making formula online is: Selling digital products. It could be your own products or affiliate products or both. Step 1: Choose a product. Step 2: Get a website. Step 3: Get Free Traffic flow to your website and start making money even when you sleep! Awesome ways to earn a little extra cash! While these may require a little more skills, you can also get paid to hear hypothetical cases (be an online juror) through sites like eJury. I have a health business where I help others get healthy and stay healthy. It's free to be a distributor. These are all great but personally the easiest and fastest way to make money online AND on the go is through reward apps. My drug of choice is GRABPOINTS. Just for signing up they already give you 1$ and they are always giving out points on their social media sites. If you use someone’s code you get +50 points and the person whose code you used will also get points. It’s really great that people pay you for just trying out apps and answering a couple of surveys perfect for stay at home moms or people in between jobs like myself. Or anyone who wants to earn extra money on the side. Anyhow this is my invite code: S6FMAC if you decide to try out GrabPoints you get 50Pts right off the bat. Hope this helps some of you out there. Now you can get some extra cash in sharexmedia. Just go and upload any image,video or sound . You can also put your website in your profile and get a backlink. Every 1000 point you will earn 1$. Great one Rebecca, AS usual. This is the perfect elixir for anyone who ever has the intention to make money online. Thanks for the post Rebecca. Another good way of making money online "that doesn't require skills" is buying and selling used textbooks. As a student, I found good opportunities selling my used textbooks after the semesters ended and this gave me an idea. There are actually books that you can buy for less than the trade -in price that give you an good profit quickly. These deals may not be simple to find, but the website www.moneyfrombooks.com shows most of these deals, and is updated daily. Hope this helps someone out and hopefully someone makes money this weekend. They accept tutors and native speakers from all over the world.